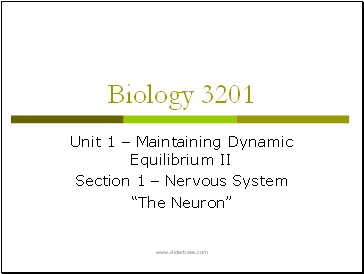 The basic functional unit of the nervous system. Dendrite  Fine hair-like extensions on the end of a neuron. 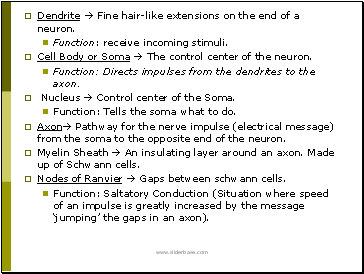 Cell Body or Soma  The control center of the neuron. 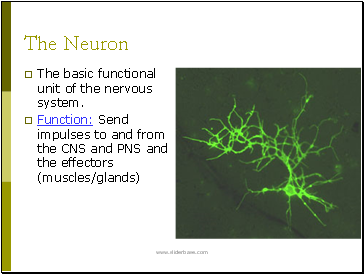 Function: Directs impulses from the dendrites to the axon. Nucleus  Control center of the Soma. Function: Tells the soma what to do. 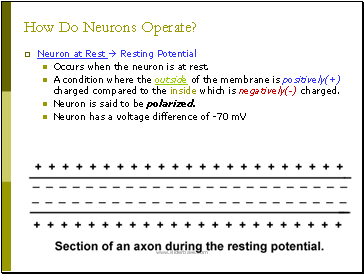 Axon Pathway for the nerve impulse (electrical message) from the soma to the opposite end of the neuron. 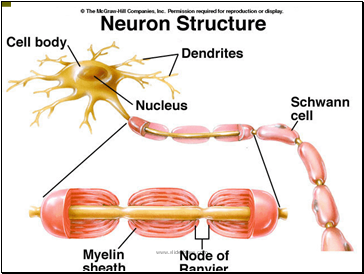 Myelin Sheath  An insulating layer around an axon. Made up of Schwann cells. Nodes of Ranvier  Gaps between schwann cells. Function: Saltatory Conduction (Situation where speed of an impulse is greatly increased by the message ‘jumping’ the gaps in an axon). 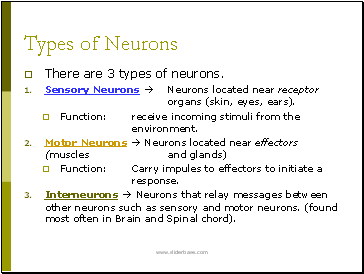 There are 3 types of neurons. 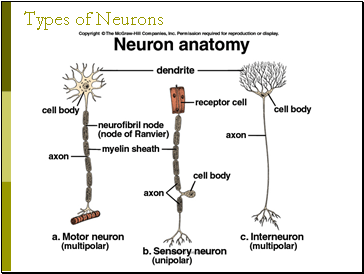 Sensory Neurons  Neurons located near receptor organs (skin, eyes, ears). Function: receive incoming stimuli from the environment. Function: Carry impules to effectors to initiate a response. 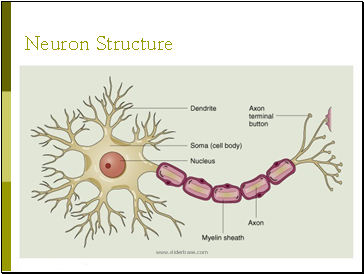 Interneurons  Neurons that relay messages between other neurons such as sensory and motor neurons. (found most often in Brain and Spinal chord). 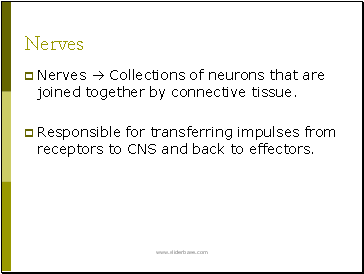 Nerves  Collections of neurons that are joined together by connective tissue. Responsible for transferring impulses from receptors to CNS and back to effectors. Occurs when the neuron is at rest. A condition where the outside of the membrane is positively(+) charged compared to the inside which is negatively(-) charged. Neuron is said to be polarized. How is resting potential maintained?